Buddhists around the world celebrate the benefits of worshipping Kannon (Avalokiteśvara), a compassionate savior who is one of the most beloved in the Buddhist pantheon. 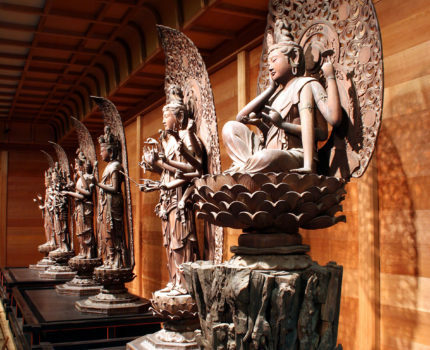 When Kannon appears in multiple manifestations, the deity’s powers are believed to increase to even greater heights. This concept generated several cults throughout history: among the most significant is the cult of the Six Kannon, which began in Japan in the tenth century and remained prominent through the sixteenth century. In this ambitious work, Sherry Fowler examines the development of the Japanese Six Kannon cult, its sculptures and paintings, and its transition to the Thirty-three Kannon cult, which remains active to this day. Sherry Fowler specializes in Japanese Buddhist art. Her interests include pre-modern sculpture, Edo and Meiji period Japanese temple prints (keidaizu), pilgrimage prints (ofuda), foreign interactions with Japanese art, issues of collecting, and ritual. Her recent research projects focus on the development of the imagery of the cult of the Six Kannon in Japan and Buddhist prints in the pilgrimage process.